Local community members, community groups and organisations have rallied together to install water stations to help keep our local koala population hydrated. The current drought is reigning havoc, not only on farmers and stock, but also our native wildlife. John Hodge and one of his water stations. Koalas rely on eucalyptus leaves as their main source of food and hydration. However, presently there is very little moisture in the leaves that they are consuming. When the temperature reaches thirty nine or forty degrees, the trees shed moisture from their leaves and consequently the koala is then in need of another source of water. Local citizen scientist, John Hodge, had noticed the increased activity of koalas searching for water sources. “Since koalas are dehydrated, they’re further stressed and they are even more vulnerable to be attacked by pets and stray dogs or hit by a car as a result of searching for other sources of water,” said John Hodge. The NSW Government Department of Environment held a workshop in Moree discussing the koala strategy in the state. 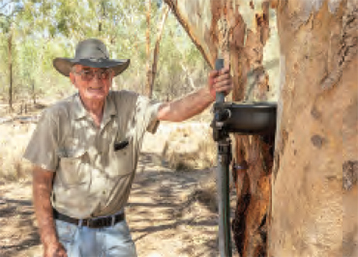 As a result of this meeting, coupled with the Gunnedah initiative where water stations have been installed and successfully utilised by the local koala population, John approached Gwydir Shire Council to install similar stations within the shire. “Koalas have been sighted more regularly in Bingara along the river as it is a safe source of water. However here in Warialda, they’re going into yards and crossing the road to the water treatment plant to access water and it won’t be long until a koala is severely injured as a result,” said John. A koala in a tree with a water station. After discussing the project with the Office of Environment and Heritage, the project was able to secure funding to cover the costs of the pipes, two water dishes and bobcat hire. The Gwydir Shire Council then installed the line, metering and dishes on Friday. They also covered the costs for a water trough for other native wildlife struggling in this heat, including kangaroos and birds. Leeah Daley, Deputy General Manager and Director, Organisation and Community Development of the Gwydir Shire Council commented on how this is a great demonstration on what a community can achieve when focused on the same result. “Drought is taking its toll on all the community; this intervention will hopefully keep some of our resident koalas and other wildlife safe from traffic and predators, now and in future extreme weather events,” said Leeah. Installing these water stations will alleviate the stress on koalas in the summer months and in times of drought. As a result of the reduction in stress, it will help prevent the severity of koalas infected with chlamydia so they have the opportunity to be treated for the condition and survive. “I’d like to thank David Walker from the Office of Environment and Heritage, the Gwydir Shire Council for their support, Charlie Woollett for making the poles and brackets for the koala dishes to be installed, Peter Hall for the use of his bobcat, Doug Hodge for operating the bobcat, McGregor Gourlay Warialda, the Men’s Shed and Gwymac Landcare for their involvement in the koala water project. It’s an amazing achievement bringing a project to fruition. It is even better when you see a koala using the water dish already, only four days after we installed them, happily and peacefully asleep”, concluded John. Mr Hodge is currently researching into installing more water stations on the north-west side of town. 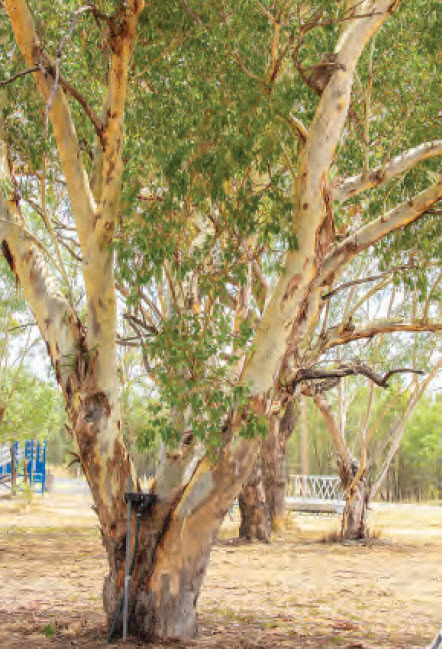 If you sight a koala, please contact John Hodge, Warialda Information Centre, or Gwydir Newspapers.